Some banks are testing the credit markets without a federal debt guarantee program that has helped them - and the FDIC - through a rough period. 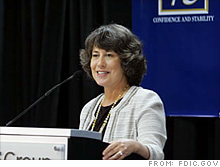 Sheila Bair has said the FDIC could use debt guarantee fees to bolster its deposit insurance fund. That subsidy has been a sweet deal for stressed-out debt issuers such as Bank of America (BAC, Fortune 500) and General Electric (GE, Fortune 500). It gave them access to low-cost funding and helped boost their profits. The FDIC -- whose deposit insurance fund is under financial pressure thanks to a wave of bank failures -- has also benefited from the premiums it has been charging borrowers. "The TLGP program has been a moneymaker for us," FDIC chief Sheila Bair said this month in Senate testimony. "We've collected over $7 billion in payments from it, and we've had no losses." But just as many banks are trying to send back their bailout money, the FDIC would like to get out of the debt guarantee business. Bair told Congress last week that regulators expect to wind down the TLGP at the end of October. Still, some legislators question whether the FDIC will be able to pull that off since many big financial firms still look weak. "It would be my sense that there are ... a lot of institutions in this country that cannot survive without that program being in place," Sen. Bob Corker, R-Tenn., said last week. In the meantime, policymakers have been encouraging banks to raise funds without help from taxpayers. Many institutions -- eager to show investors they are strong enough to shun federal aid -- have rushed to comply. The FDIC raised the premiums it takes to guarantee some debt issues last month. Last week, policymakers told banks seeking to repay their loans under Treasury's Troubled Asset Relief Program that they must first wean themselves from subsidized borrowing through the TLGP. Several banks proceeded to sell bonds without the FDIC's backing. Among them was U.S. Bancorp (USB, Fortune 500), which this week sold $1 billion of what it called medium-term notes -- which typically mature in five to 10 years. Other firms were already moving away from the TLGP before last week's release of the results of stress tests conducted on 19 large banks. Regulators found that 10 of those banks need to raise about $75 billion in new capital in order to be able to withstand losses that could result in a worst-case scenario for the economy. Three big banks that have made no secret of their desire to repay their TARP obligations -- JPMorgan Chase (JPM, Fortune 500), Morgan Stanley (MS, Fortune 500) and Goldman Sachs (GS, Fortune 500) -- have sold $14 billion of non-guaranteed debt over the past month. Previously, these three banks had sold $85 billion of FDIC-backed debt and just $6 billion of non-FDIC-guaranteed bonds and notes since the inception of the TLGP in November, according to data from Dealogic. "Once you've made that leap you're probably on firmer ground," said Bill Larkin, a fixed-income portfolio manager at Cabot Money Management in Salem, Mass. Even banks that the market believes are less robust -- such as Bank of America -- have been issuing non-guaranteed debt. BofA, which is under orders to raise its common equity by $34 billion, sold $3 billion of five-year notes last Thursday. Larkin points out though that BofA "had to pay up to do that deal." The bank paid more than a percentage point above comparable issues from rivals. GE Capital, the second-biggest issuer of FDIC-guaranteed debt with $43 billion outstanding, has twice sold non-guaranteed debt in the last week, spokesman Russell Wilkerson said. "TLGP has been a tremendous help in making sure lending continues throughout the economy," Wilkerson said. "It's important for us to show our ability to raise money outside the TLGP, and we have been doing that whenever the markets have opened up." Wilkerson said GE Capital's decisions on when to use the FDIC program are driven by market conditions, such as the cost and maturity of possible debt sales. He said the recent flow of non-TLGP deals offers another sign that once-broken markets are starting to stabilize. "We're seeing more and more deals getting done" without guarantees, Wilkerson said. "That's better for all of us." Though healthier banks are good for the economy, the shift away from the TLGP could slow the flow of funds into the FDIC's coffers at a time when the agency's industry-funded deposit insurance reserve is under pressure. The deposit insurance fund's balance dropped 64% last year, as 25 banks failed. That left the fund below its statutory minimum balance. Already this year, 33 more banks have failed. Bair recently estimated that the agency will spend $65 billion over five years cleaning up failures. The premiums taken in under the TLGP could help defray those costs, Bair said last month. "If this money isn't needed to cover defaults, it will go into the insurance fund and could help reduce future insurance assessments," she told an American Bankers Association summit April 1. Karen Thomas, executive vice president for government relations at the Independent Community Bankers of America trade group, said "it is to be expected" that firms are trying to exit the TLGP, which she notes "was always intended to be temporary." She said the bigger issue for the deposit insurance fund is the status of a bill that would more than triple the FDIC's credit line with Treasury. If signed into law, it could give the agency the flexibility to cut a recently proposed special assessment on banks in half and rebuild the deposit fund over a longer span. That bill, passed last week by the Senate, is pending in the House and could be signed by President Obama within weeks, Thomas said. The Senate measure would boost the FDIC's permanent credit line to $100 billion from $30 billion - with a provision to rise as high as $500 billion in some cases.